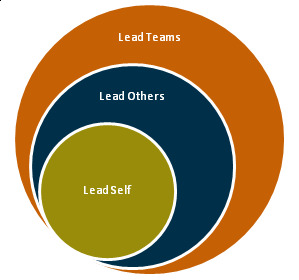 differencemakers community blog: How Do You lead Yourself? The way to Total Leadership is through Leading Your Self. Remember, the reality of life starts with 'You'. If You exist, everything has a meaning. If you Know yourself, you start understanding your position and power in this universe. If you realise your true potential, you understand why you are here and what is your purpose. If you Lead Yourself, you will be able to lead others. The picture opposite perfectly explains the 3 Circle Philosophy of Transformation when applied to Leadership. The 3 Circle Philosophy, a unique tool for development, is based on insights from the research on Fractal Universe, the Composition of all Matter and how Human Life can be interpreted. The 'Core' denotes self, the 'Inner Circle denotes 'Relationships' and the 'Outer Circle' denotes 'linkages' for offering your value to the world. The journey to Leading yourself however starts from Introspection. Just as a person has to first climb a mountain before he can have a larger view of the world surrounding it, every one has to have an inner journey to climb atop his own self and see how everything else looks from there. Using the simple formula 'Being, Knowing, Doing', you can initiate the leadership process within you. It is a continuous cycle that exists through our lifetime, only that we do not realize its presence and hence are not able to capitalize fully on its worth. Once we understand this cycle, its value can be harnessed very easily and effectively. 1. Being - A child starts his life by simply being. He/she knows instinctively to cry for his/her mother and seek nourishment. Similarly, you have to start by being who you are, by responding instinctively and intuitively by virtue of being gifted those abilities through your genes or 'the stars that you were born with'. Similarly, in each phase of life, viz. Teenage, adulthood, career, marriage, children, you have to initially accept and feel comfortable with the way you 'ARE'! Reflect upon it, and you will feel like smiling, I promise! 2. Knowing - True Knowledge of Self happen when you look inwards and analyse your 'Being'. You become aware strengths, weaknesses, skills, intelligence, likes and dislikes. All this gives you a sense of where you stand, in comparison with what exists outside of you. Remember, this is only a knowledge stage and not a realization stage. Whenever you are in the state of knowing, your mind is at rest, and your mindfulness is at work. You are never tense or perplexed, there is an air of calmness and self-awareness, not allowing yourself to slip into a state of 'ego', 'worthlessness' or 'self-pity'. Knowing also includes analyzing in terms of coming to terms with what will work for you and what will not work for you. In other words, finding your 'magnetic compass' or 'True North'. 3. Doing. Once you have done an internal scan, you are now better placed to make your choices. These choices basically stem from the Vision of what you want to be. Once you are clear of that, you start making a mental pathway of how you want to or how you can reach there. That becomes a springboard for your Actions. One thing that separates 'Doing' from 'Knowing' is the Intent. After 'knowing' yourself, the nature of your intent can push you to make a good choice or a bad choice. If the intent is born out of desire to be of better use to the world 'outside of you', it will result in a good choice, but if the intent is borne out of negative thoughts and feelings like 'scoring over others', 'putting others down', 'seeking revenge' then it will result into making bad choices. Once an action is committed and begun, there is no turning back to the point that you originally were. Because now you have become someone else, based on your Vision and Intent. 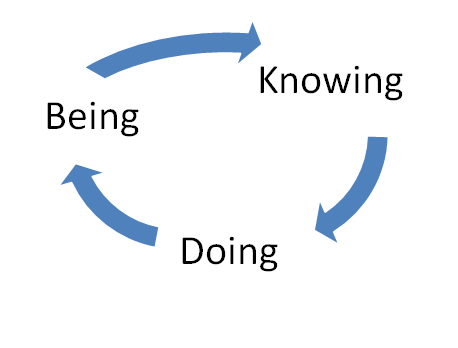 How Does the Cycle of Being - Knowing - Doing Continue? Once you complete a cycle of Being, Knowing and Doing, you are transported to a different level of consciousness where a different 'you' exists. You reach a different state of Being, which you must experience all over again to realise the change within you and again 'Know' yourself. This is an inbuilt process of realignment in your inner self that drives you towards self actualization. The process of 'Being - knowing - Doing' does not necessarily happen in compartments, but flows freely such that you are able to 'be' in a particular domain, 'know' yourself in relation to a different domain and 'take actions' in a yet another domain. This complexity builds different layers to your personality, which allows you to build on your strengths or competencies and work on your limitations. By following the process of Being - Knowing - Doing, you get freed from the stress of trying to win, because winning then becomes a byproduct. By aligning your actions to your internal compass, you are automatically driven towards the path that will bring you personal glory, how small or insignificant it may be for the world outside. In the end, it is all about reaching where you want to, right? Are you following your own cycle of Being- Knowing - Doing? PS: You may also like to read the post 'Why Must You Lead?